A Turkish NGO today released video footage allegedly showing Russian airstrikes destroying a bread bakery established in Syria’s Idlib province that feeds around 50,000 people daily. The Foundation for Human Rights and Freedoms and Humanitarian Relief (IHH) posted a video on Sunday that shows the destruction of the bakery which produces around 16,000 loaves daily. 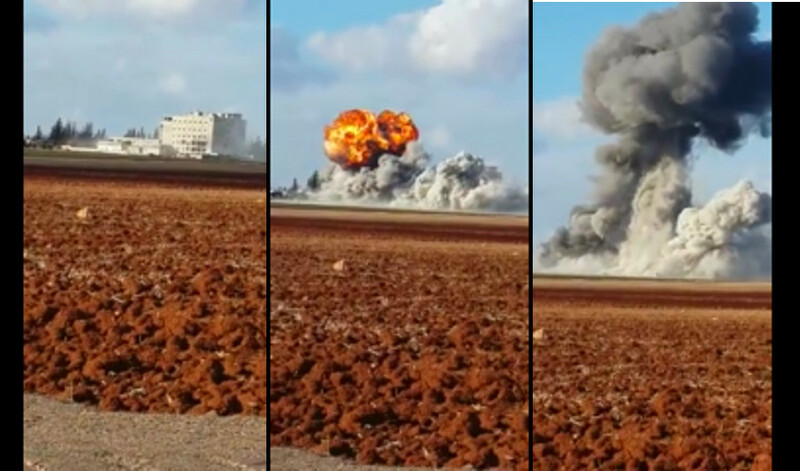 While Russia claims that its airstrikes only target Islamic State’s positions, IHH claimed that the in Idlib’s Saraqib sector is free of ISIS activity. Moscow has not responded IHH’s allegations, but the NGO Syrian Observatory for Human Rights reported that Russian has been carrying out air raides in the Idlib province. There was world-wide condemnation of Russia’s actions, with many accusing Moscow of committing war crimes in support of beleaguered Syrian President Bashar al-Assad. “Why are you bombing bread factories that are being run by charities to provide people with the food they desperately need unless it’s to torture innocent civilians and help your devil of a friend Bashar al-Assad hold on to the burning rope of little power that he still assumes he has?” activist Isa Toy Miah from London, UK asked. The latest incident comes in the wake of growing controversy over the bombing of a convoy of Trucks coming from Turkey to Syria in in Azaz, on the Syrian side of the border. Turkish media initially claimed that the trucks belong to an IHH aid convoy, and accused Russia of a revenge attack following the downing of a Russian Su-24M tactical bomber by Turkish F-16 aircraft. However, IHH denied that the trucks belong to the organization, even though their civil defence teams helped to put out the fires. Russian state-sponsored media quoted Syrian government officials who claimed that the trucks were used by Turkey to supply weapons to ISIS. Russia’s President Vladimir Putin accused Turkey of profiting from Islamic State’s oil, and claimed that Turkish forces downed the Russian aircraft to protect ISIS’s oil infrastructure. Turkey’s President Recep Tayyip Erdoğan initially responded to his Russian counterpart’s accusation saying that it was Moscow’s ally Syrian President Bashar al-Assad, and not Ankara, who was of buying oil from ISIS. Erdoğan’s tone has subsequently softened somewhat, with the Turkish President saying that he’s “truly saddened” about the incident, but still refusing to apologize over the incident that has lead to Russia imposing tough sanctions on Turkey. The only contract of 50 million US dollars has is ISIS. allasnackbar. this “NGO” is ran out of one mans bedroom…..
Now it’s a ghost town…. COD ftw Faze get at me Aloha Snackbar!!!! !